Also, the results of the active directory discovery process generated every 15 minutes, which are normally logging in event 2080, “Exchange Active Directory Provider has discovered the following servers with the following characteristics”, was missing. 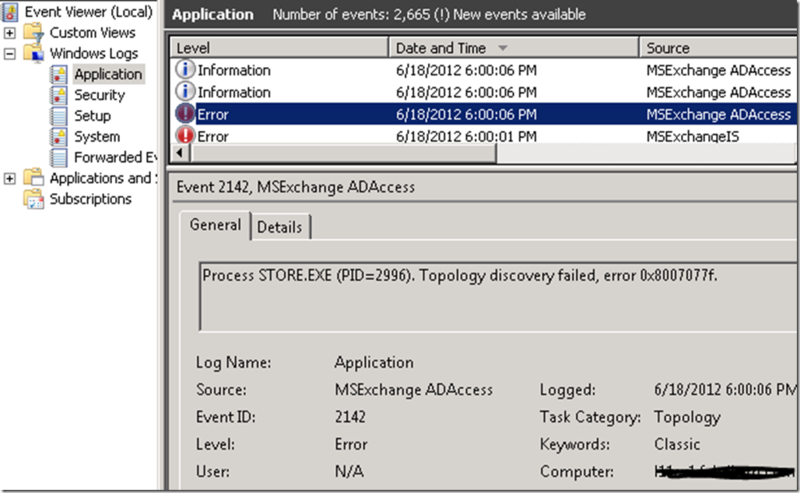 Note that because the system could start the Microsoft Exchange Active Directory Topology service (until it failed and is restarted by dependent services), Exchange’s other services were also triggered, leading to almost indefinitely restarting services as configured in their corresponding service recovery actions sections. As you can see from the shot, here was a potential cause of the problem. First, there was a site without domain controllers. Second, there were no subnets defined. So, in this situation, it is undetermined in which site Exchange is located. When a system can’t be determined to which site a computer belongs, the function DSGetSiteName, used to retrieve the current site, returns an error 1919 0x77f (ERROR_NO_SITENAME). Consequently, the Exchange Active Directory discovery process fails and eventually Exchange fails. You can inspect the current discovered site using nltest /dsgetsite or by having a peek in the registry at HKLM\System\CurrentControlSet\Services\Netlogon\Parameters\DynamicSiteName. Remove the empty site definition. It turned out the empty site was a place holder for a future site, so we went with the option of adding proper subnet definitions. After adding subnet definitions, like you normally should when working with multiple sites, including the scopes where the Exchange servers and domain controllers were located, and associating it with the main site, things started working again. Note that the NetLogon service determines site association membership at startup and every 15 minutes. The Microsoft Exchange Discovery Topology service maintains this information by caching the information in the msExchServerSite attribute of the Exchange server object, in order to reduce load on active directory and DNS. Therefor, you might need to wait or restart Microsoft Exchange Discovery Topology if you want to renew site association membership. This entry was posted in Active Directory, Exchange 2007, Exchange 2010 and tagged AD, Deployment, Exchange, Network by Michel de Rooij. Bookmark the permalink. I ran into the very same problem, thanks for the solution. You don’t know how you helped me today!!! Thank you very much!!!! Worked on this forever and you saved the day. You should put a PayPal link on here. you are a day maker!!! !